As I mentioned in an earlier post, I’ve been an artist-in-residence at UConn’s Counterproof Press since January. After spending many sessions with artist and master printer Laurie Sloan exploring various processes, I found that I was drawn to the most uncomplicated prints that featured direct, unadorned line drawing printed in one color. Since etching lends itself nicely to this form, I settled on making several editions of intaglio prints. When I noticed that Artsy had an ‘Intaglio” filter on the Art Basel section of their website, I was curious to see what prints would be on view at the fair, which takes place in Basel, Switzerland, from June 19-22. 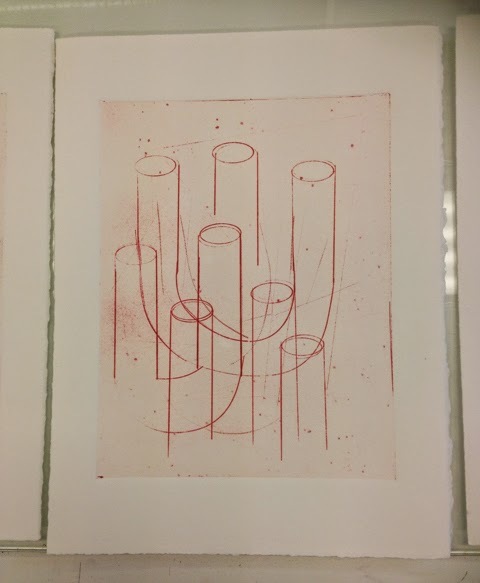 Here are a few, and I think they reflect the capacity of a straightforward printmaking technique to turn a simple drawing into something decidedly special. Robert Mangold, Framed Square with Open Center A and Framed Square with Open Center B, 2013, soft-ground and aquatint etchings, 27 1/4 × 27 inches, edition of 40. Georg Baselitz, Fare Well Bill, 2014, set of 10 Aquatint and line etching prints on Hahnemühle 350 gr, 33 1/2 × 25 3/5 inches, edition of 15. Elizabeth Peyton, Alex (Katz), 2012, 2012, etching on Twinrocker handmade paper 14 7/8 × 11 7/8 inches, edition of 20 + 5AP copy. Richard Tuttle, Nature-Media/II, 2014, one-color etching, 13 × 11 inches, edition of 35. Mel Bochner, Blah, Blah, Blah, 2014, etching with aquatint 11 × 8 1/2 inches. Vera Molnar, Quelques lignes à julije, 2007-2013, etching 12 3/5 × 12 3/5 inches, edition of 21. Max Beckmann, Schöne Aussicht (Winterlandschaft), 1920, drypoint 9 1/2 × 12 3/5 inches. Although we haven’t printed the editions yet, this is the bon a tirer proof for one of my plates at Counterproof Press. Art Basel in Basel, June 19-22, Basel Switzerland. If you can’t go to Switzerland, Art Basel in Basel galleries also post images of the artwork they are bringing to the fair on Artsy. And don’t forget to check out the Intaglio section.